STAMPS: You've Got This (SU). PAPER: Moonlight designer papers by SU, White. INK: Hello Honey, Memento Tuxedo Black. 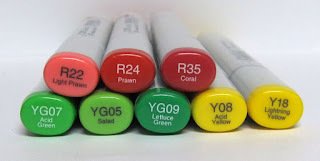 ACCESSORIES: Enamel dots by MME, Diamond Stickles, Copics. Good Monday everyone! It's tall and skinny week at the Mojo Monday challenge blog and Julee has a perfect sketch to highlight the new Verve Deco Borders stamp set! To get the borders stamped straight and to get even spacing between them, my MISTI tool was a huge help to get them placed correctly! 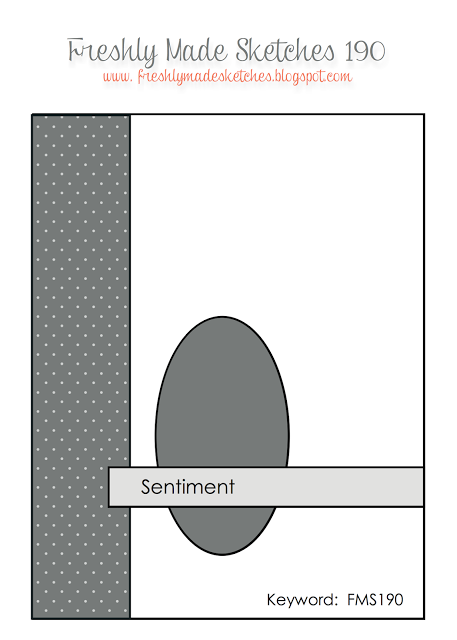 It also allowed me to stamp the image twice for a bolder black color. I just love the new font in this set! waves for some extra pizzazz! 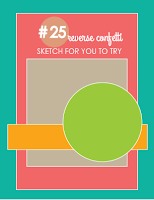 I'm using the basic sketch for the current Retrosketches Challenge - tweaking it by adding the circle element. If you're needing a refresher course like I did with the sailor knot steps, the YouTube tutorial link by Barbara Anders is HERE. My finished card is 5 1/2" square. 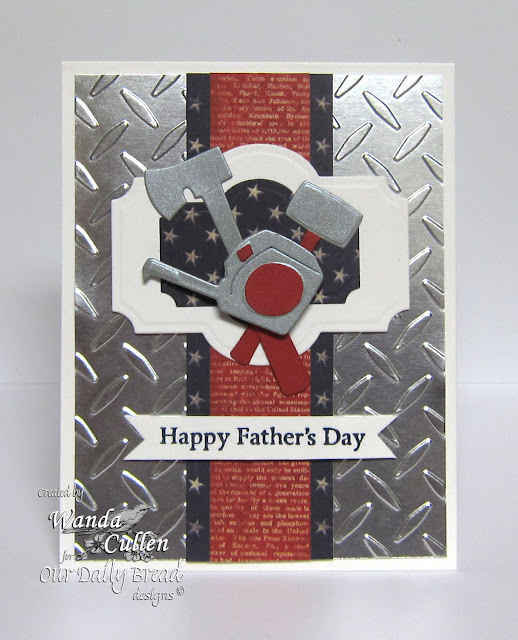 I used my corner chomper and added a die cut flag using Verve's Flag It Die Set and topped it off with a silver pearl. 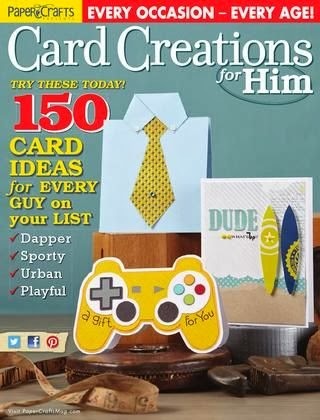 An easy, clean layered card design! 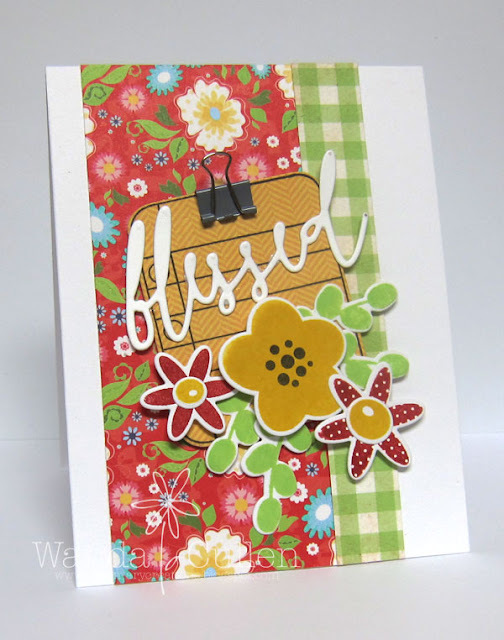 PAPER: Miss Caroline "Dilly Dally" by MME, Real Red, White. We hate to say goodbye to Nancy Thomas who has been such a fabulous guest designer during June! Thanks Nancy! 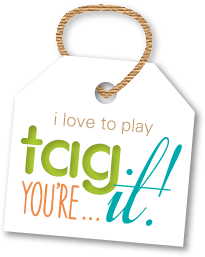 Stay tuned next week to see who our new guestie will be! Thanks so much for stopping by! 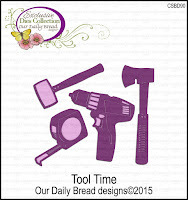 Hope to see you in the CTD gallery! 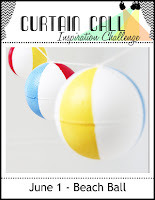 It's time for another Color Challenge on SCS and this week, Maura has chosen Real Red, Marina Mist and Night of Navy. The dessert option is to use enamel dots, candy dots, or sequins. 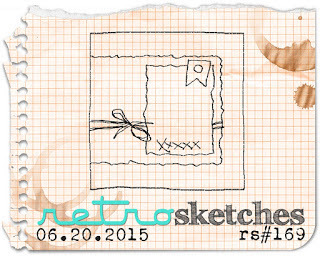 I'm using the layout for Jen's Sketch For You To Try for June - a really fabulous sketch! I really intended to go patriotic with my card theme, but guess my packing for beach vacation influenced the nautical stamp set - Happy Harbor - to be chosen instead! Papers are from the Yankee Doodles 6x6 pad by We R Memory Keepers. I layered the red die cut panel over silver foil CS, so the stars really do shine depending on the angle of the card in the light. The lighthouse was silver embossed, fussy cut and popped with foam tape. 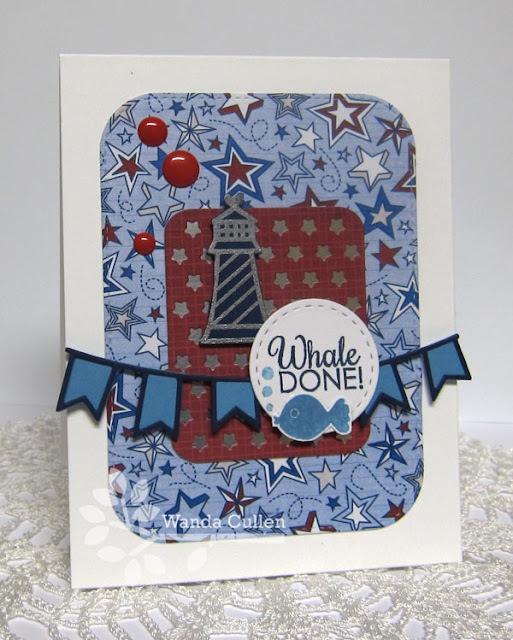 Dies: Stitched Rounded Rectangle STAX Die-Namics by MFT; Stitched Circle die by Lil Inker Designs;Double Banner Garland and Stars Pretty Panels Confetti Cuts by Reverse Confetti. Hi everyone! Hope your Monday is off to a grand start! The Mojo Monday Challenge is always a great way to jump start your creativity and Julee has a fabulous sketch you won't want to pass up! 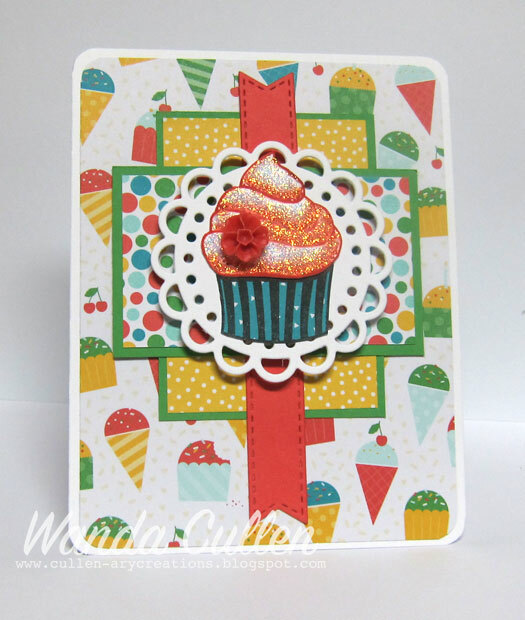 I wanted to try out these fun new patterned papers by SU using the newly released in colors. Aren't they festive and fun? and covered the icing with Diamond Stickles. I loved the sweet little blossom accent sent to me in a freebie package from my SU demo with my order! 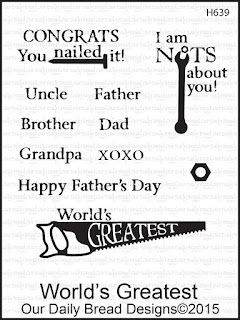 I chose to add the sentiment only to the inside. 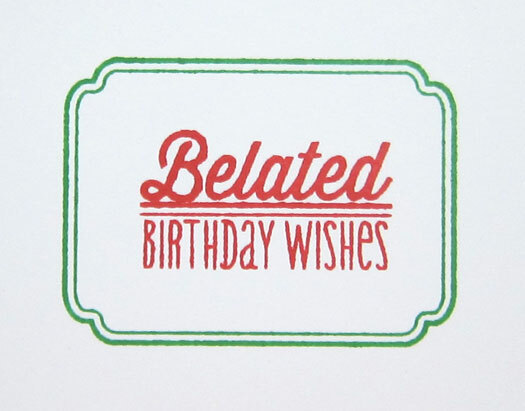 I seem to be forever late with mailing out birthday cards, so was glad to see this belated sentiment available! PAPER: Cherry on Top (SU), Watermelon Wonder, Cucumber Crush, White. INK: Watermelon Wonder, Cucumber Crush. ACCESSORIES: Stitched Fishtail Flags STAX and Small Doily Die-Namics by MFT, Diamond Stickles, Blossom Accents (SU), Corner Chomper. Hi everyone! 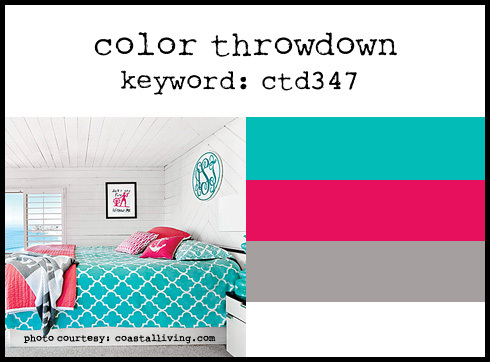 It's time for a new challenge at Color Throwdown and Broni has chosen this great summery combo for us: turquoise, hot pink, gray and white! When I saw the bedspread, I knew I wanted to use PTI's quatrefoil die for the background. 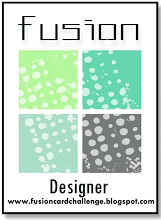 I then added a Stitched Fishtail Flag and layered the Leafy Flourish die on top (both dies by My Favorite Things). 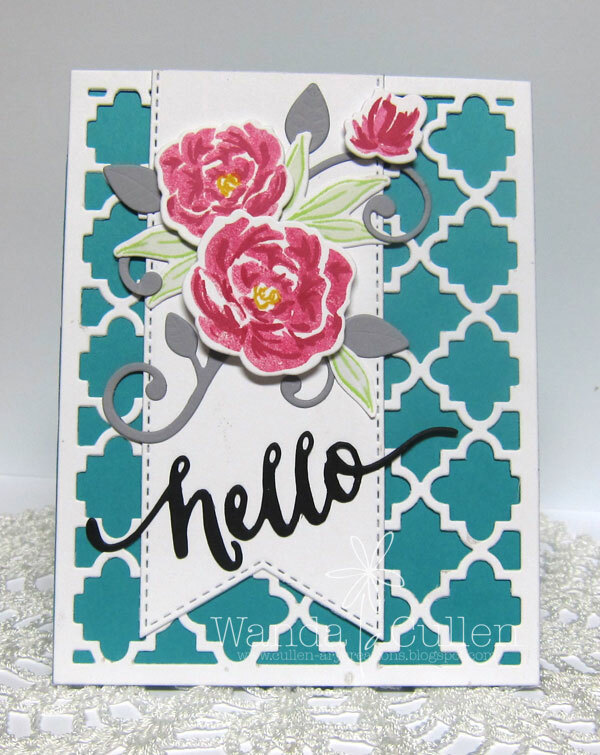 The flowers are from Pretty Peonies by WPlus Nine - stamped with Sweet Gelato - and love the coordinating dies that make it so easy to do some flower arranging! The leaves were stamped using WPlus9's Fairy Dust ink (a very pale gray) then the outline stamp was with Beanstalk (just had to sneak in a wee bit of green) - both Pure Color inks from the same company. The 'hello' die is also by WPlus9. Hope you're having a terrific Tuesday! 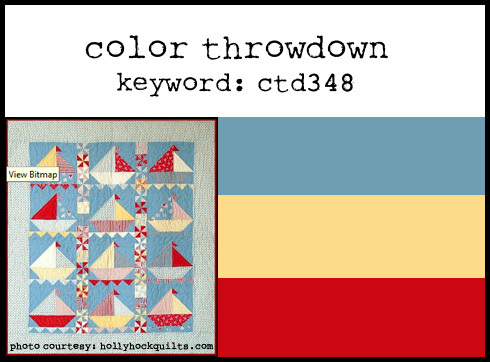 I'm guesting for the Color Challenge on SCS this month and Barbara has chosen Rich Razzleberry, Daffodil Delight and Bermuda Bay with dessert to use a die cut or punch in our design. I'm also using the current Freshly Made Sketches layout. All stamps and dies used are by My Favorite Things. I colored the water lily with Copics then fussy cut and popped with foam tape. 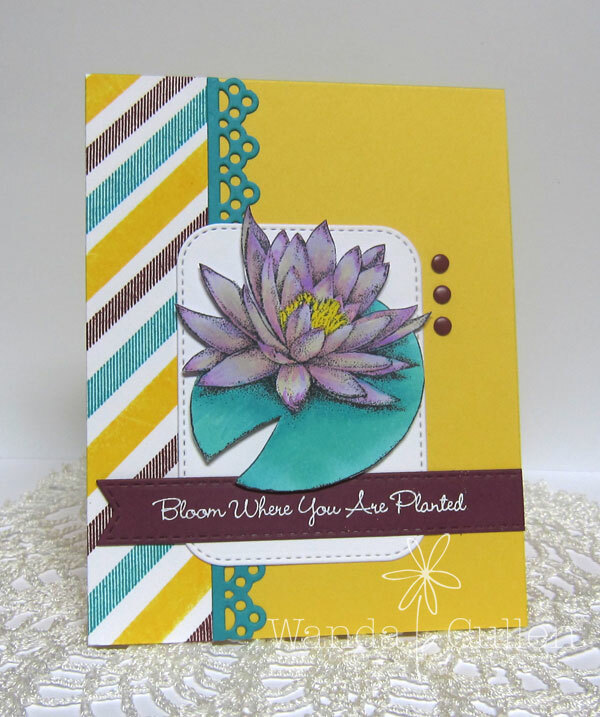 stamp set in Rich Razzleberry, Daffodil Delight and Bermuda Bay inks. The sentiment is from Sunflower Girl and the lily is from Flowers 3. A lesson I learned 18 years ago from my very first SU demonstrator is to add a hint of yellow whenever you're coloring flowers or leaves. It makes the images look so much more natural! 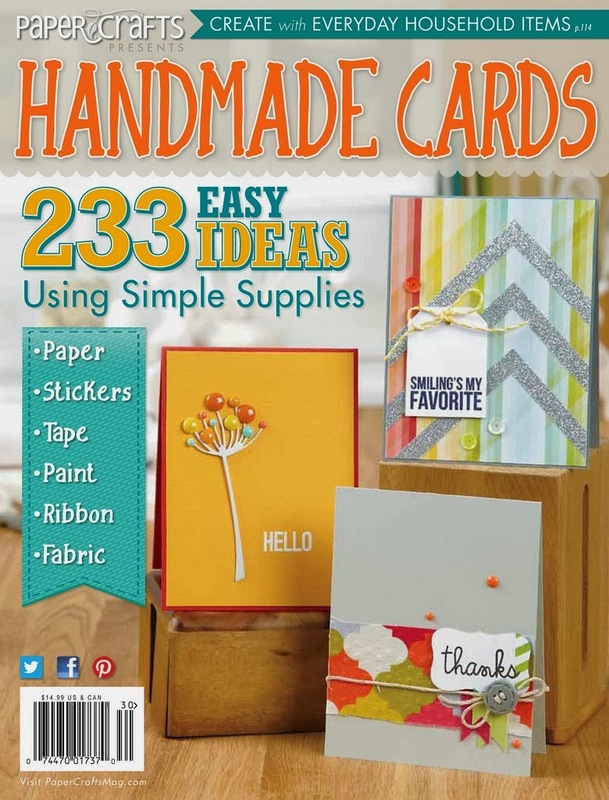 Dies: Dainty Lace, Stitched Rounded Rectangle STAX, Stitched Fishtail Flags STAX - all by MFT. A quick post of a card that is a CASE of mrslaird (Paula) who is stepping down from the CAS challenge on SCS. 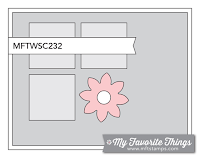 The CAS challenge for today is to either create a thank you card or to CASE one of her cards. 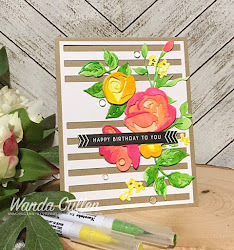 I was inspired by her card HERE for this simple one layer design that uses washi tape (by SU), a sticker and 2 die cuts. 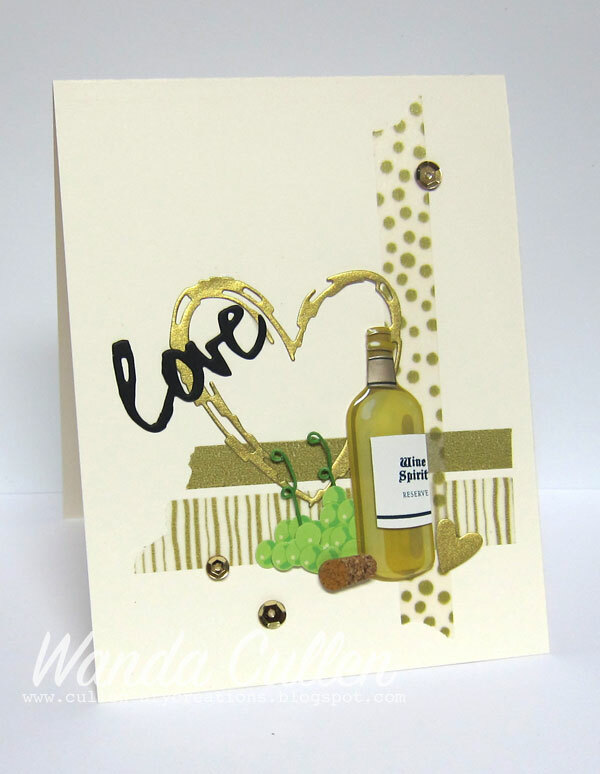 The sentiment is from PTI's Wet Paint die set and the Sketch Heart die is by Simon Says Stamp. Another Monday and that means it's Mojo Monday Challenge time! 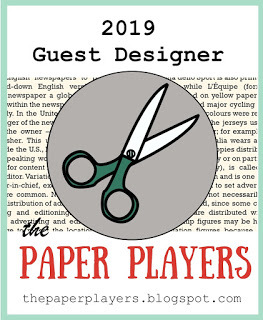 In case you missed the announcement last Wednesday, Julee added two new mojomakers: Lori Tecler of Inking Aloud and Justin Krieger of JKCards! I'm so excited to have them joining us as they will both bring a lot of creative talent and be great inspiration! are all from Simple Stories "Summer Fresh" 6x6 pad and the clouds are fussy cut from one of the patterned papers. 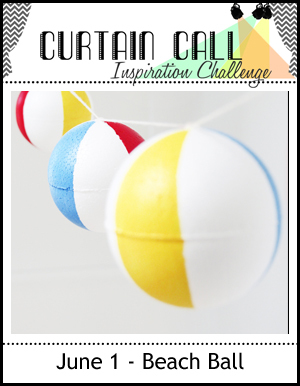 Free 4 All - use the letters in JUNE (Jute twine, Umbrella, Neon colors, Embossed stitching). PAPER: Craft It Flora by Recollections, White by PTI. 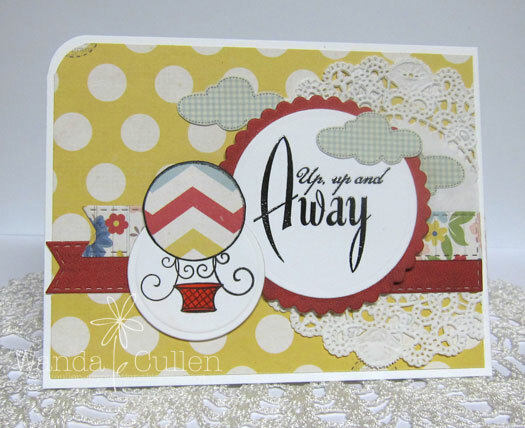 ACCESSORIES: Umbrella Die-Namics by MFT, Stitched square dies by Lil' Inker Designs, Jute twine, 1/4" circle punch. 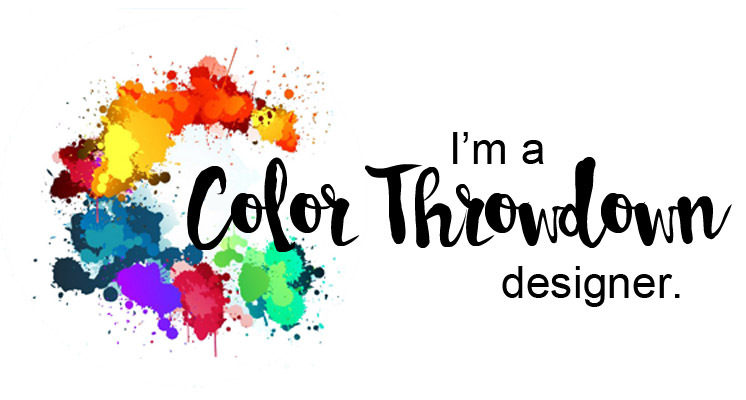 Today, some of the designers at Our Daily Bread Designs are taking a look back at the June release...hoping to inspire you to go shopping at their store if you haven't already! 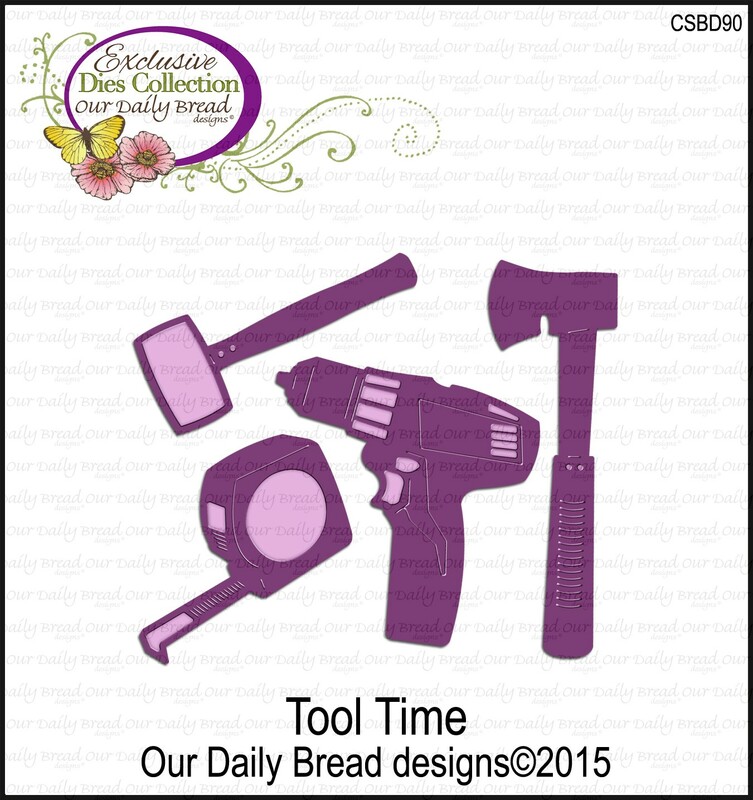 This month we had a sunshine theme for you and we had tools for the handy man or woman in your life! 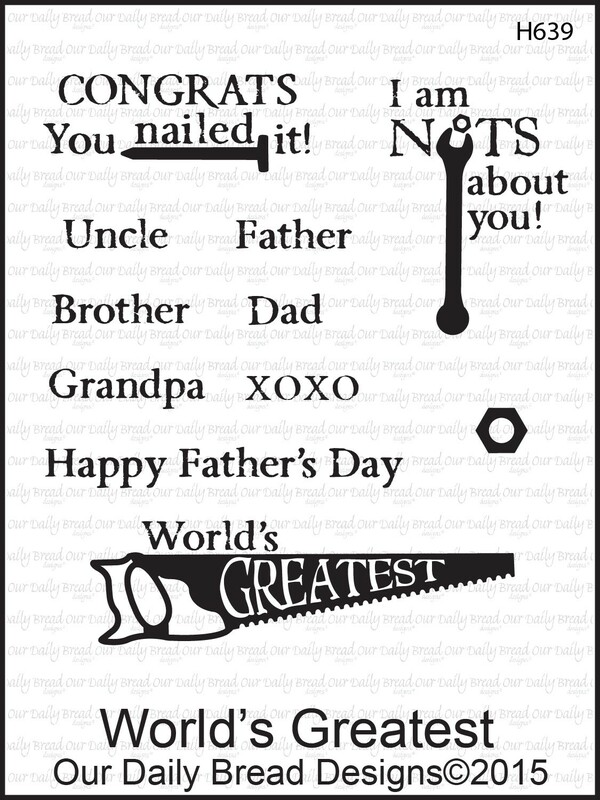 stamped sentiment from World's Greatest. 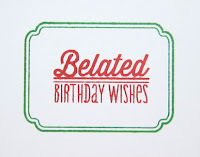 After getting my hands on some silver foil paper, I knew I wanted to emboss it for the background. 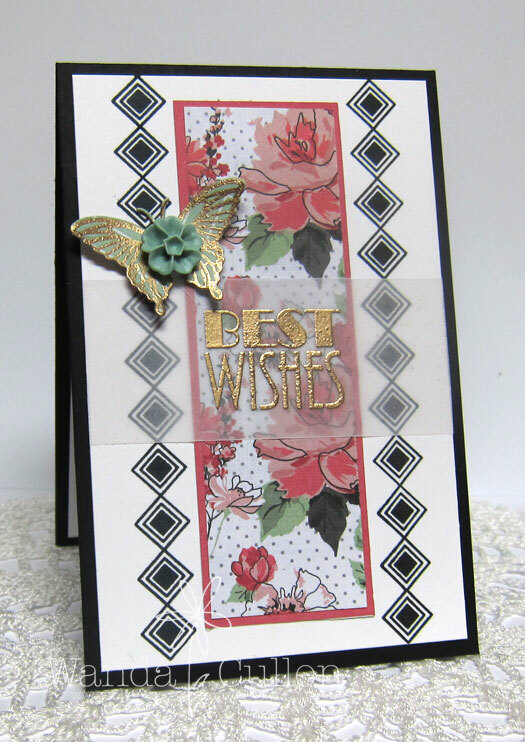 I layered up a couple of Labels Twenty One Spellbinders dies then topped it off with 3 of the paper pieced tools. You can see the difference in the brushed metallic silver CS that I used with the tools compared to the shiny foil. 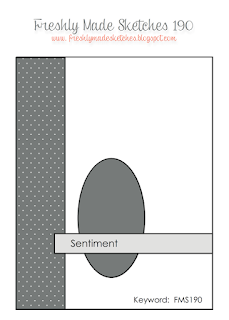 I used a square punch to cut the ends of the sentiment banner. 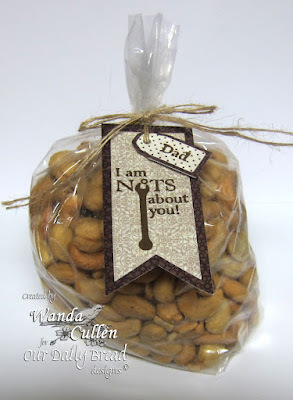 I have another quick tag creation that I attached to a bag of cashews that I shipped to my dad as part of a box of goodies for his 89th birthday (June 15). It uses the new papers from the Vintage Ephemera Collection, a Mini Tags die, a Pennant die and a sentiment from World's Greatest. I fussy cut the bottom layer of each tag. Perfect gift from a daughter who loves puns - lol - for a dad who loves nuts! 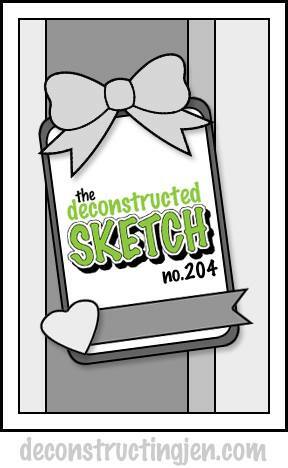 It's sad, but true...this is Jen's last Deconstructed Sketch Challenge! It has been one of my 'go to' challenges with so many great layouts over the years, but I totally understand how life evolves and things change. I decided to dust off some older Bazzill papers and used all Reverse Confetti stamps and dies except for the 'blessed' sentiment that is new from WPlus9. 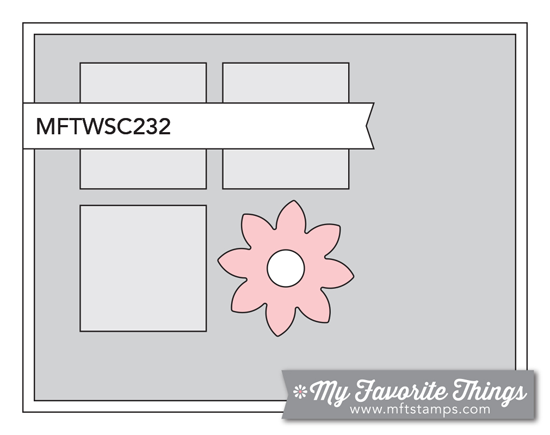 STAMPS: Petals 'n Posies and Class Act - both sets by Reverse Confetti. 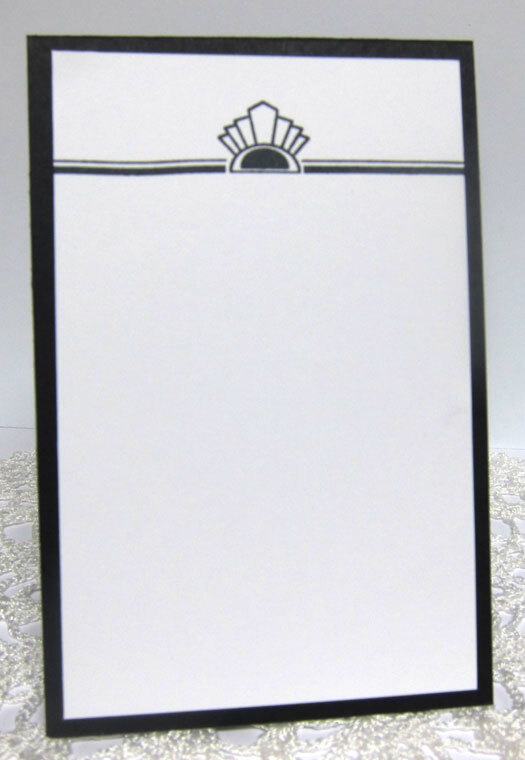 PAPER: Avalon by Bazzill Basics Paper, White by PTI. INK: Real Red, Crushed Curry (SU), Beanstalk (WPlus9), Versafine Onyx Black. 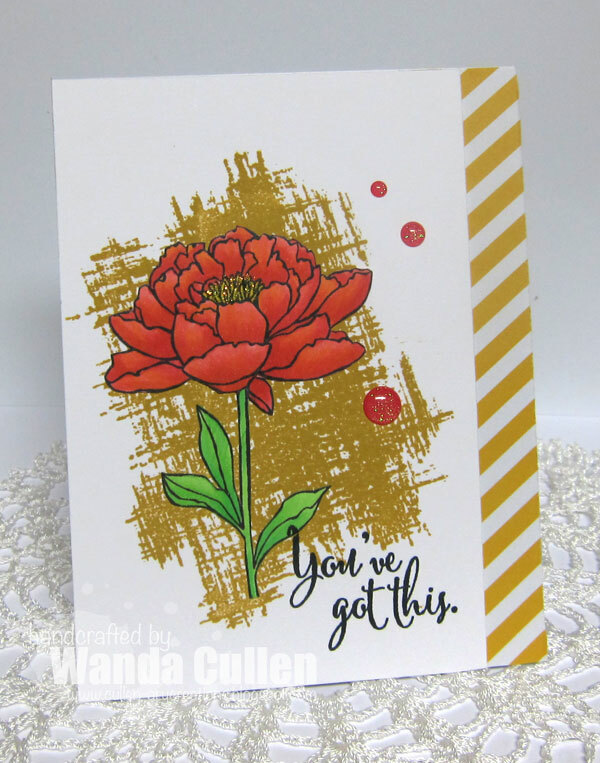 ACCESSORIES: Petals 'n Posies dies and Class Act die by Reverse Confetti; Paper clip by SU; Blessed die by WPlus9's Doodle Bud dies. It's Release Day at ODBD!